Jacob Stockdale has 12 tries in just 14 internationals but few will have given him more pleasure than last night's touchdown in the 16-9 win over the All Blacks. The prolific Ulster winger was on the end of a clever switch play involving Johnny Sexton and Bundee Aki, before he lofted a chip over New Zealand lock Brodie Retallick and collected the ball ahead of Aaron Smith before dotting down to send the Aviva Stadium crowd into raptures. 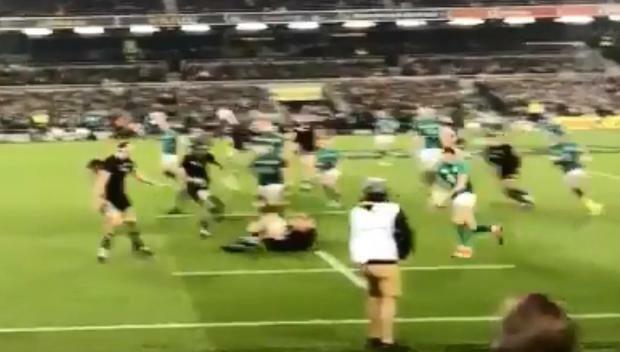 Fan footage from the opposite side of the ground offers an alternative view of the play, the quality of Aki's pass, how Stockdale identified that Ben Smith had vacated the space behind him and the precision of Stockdale's execution of the kick and the pace and power he used to cross the whitewash. Luke McGrath revealed that the move had been practised in the lead-up to the game but praised the 22-year-old for having the ability to deliver it against the best team in the world. "That play that Jacob scored from, you do that during the week and you're never sure if it's going to work in the game, but thankfully it did. "Once Jacob gets an opportunity, he saw Ben Smith come up into the line and he chipped in behind. "And once he gets those opportunities, he's absolutely ruthless, he's an unbelievable try scorer.